Thinking about dental implants? Dental implants are the gold standard in the replacement of teeth. Rose Dental Associates in Albany offers a full range of dental services, including dental implants. Here are five extraordinary benefits of dental implants. The highly-skilled dentists at Rose Dental Associates offer a wide range of restorative dental treatments, including dental implant restorations. Drs. Santoro, Champa, Beer, and Hageman believe dental implants provide the most natural-looking and functioning tooth replacement choice available today in in Albany, NY. Fortunately, tooth loss--involving one tooth or multiples--does not have to spoil smile aesthetics, facial features, eating or speaking. The dentists at Rose Dental Associates in Albany have the expertise to evaluate prospective implant patients and to place custom-fabricated dental implants and lifelike restorations, such as porcelain crowns, for well-functioning, no-gap smiles. 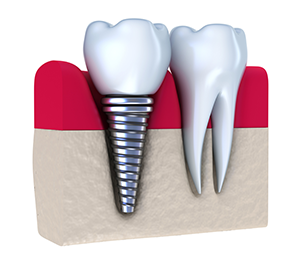 Composed of titanium, the dental implant screws right into the jaw. The dentists at Rose Dental Associates use cutting edge dental implants known for their design stability and affinity for human bone. Through a process called osseointegration, the dental implant melds with the jaw, providing it with a large measure of strength and density. With good in-home brushing and flossing and regular preventive visits to Rose Dental Associates these restorations function well and look great for decades. For more information on Dental Implants, call Rose Dental Associates in Albany, NY at (518) 456-7673!